As the team bus rolled ominously through the streets of Belfast, the Irish players joked morbidly about which of them was going to get murdered first. Niall Quinn remembers looking out of the window and seeing a row of kids, no more than 10, pointing their fingers at them like guns and pretending to shoot. At the front of the bus, Special Branch officers sat in green tracksuits to disguise themselves as players, their rifles perched in their laps. The year was 1993, and Northern Ireland vs Republic of Ireland had a fair claim to be the most foreboding fixture in the whole of international sport. It had been a year of unspeakable atrocities. Three weeks earlier, two IRA members had walked into a chip shop on the Shankill Road in Belfast and set off a bomb. Ten people were killed, including one of the bombers. A week later, on the 30 October, gunmen from the Ulster Defence Association walked into a pub in Greysteel, County Londonderry, and shouted "trick or treat" before opening fire, killing eight people. And so it was in this climate of casual violence, mutual loathing and mortal dread that the Republic squad arrived in an attempt to qualify for the 1994 World Cup. They took the plane from Dublin to Belfast to avoid using the border crossings. On the coach to the stadium, the players were told to avoid the windows and sit in the aisle seats. On the pitch, home fans shrieked ferally at the visiting players, assailing them with chants of "Pope-sucking whore", telling Alan Kernaghan they hoped his mother died of cancer. "Right," manager Jack Charlton announced in the dressing room after Alan McLoughlin's equalising goal had secured the Republic their passage to America. "Let's get the f*** out of here." By contrast, the headlines that greeted Thursday night's game between the two sides were a tad more sober. "Republic limp to stalemate with Northern Ireland," said RTE. "Michael O'Neill rues missed Northern Ireland chances," said the Belfast Telegraph website. After an uneventful goalless draw, most of the talk was about the saves of Darren Randolph, the industry of Steven Davis, the toothlessness of the two attacks and their impending Nations League relegation. It was all drearily, gloriously prosaic. 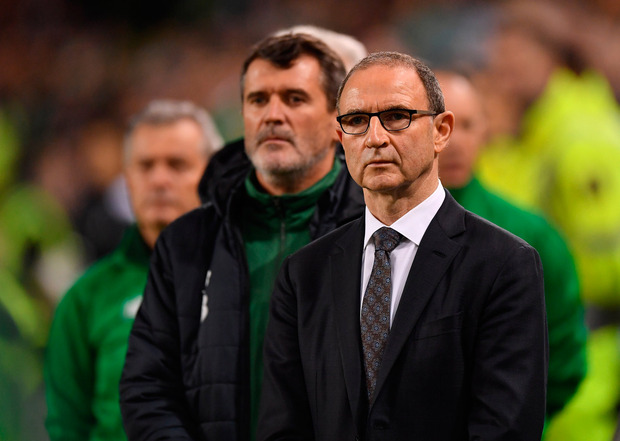 15 November 2018; Republic of Ireland manager Martin O'Neill prior to the International Friendly match between Republic of Ireland and Northern Ireland at the Aviva Stadium in Dublin. Photo by Seb Daly/Sportsfile. There was some chirping in the stands, but nothing out of the ordinary. Some booing of "God Save the Queen". The customary frosty welcome for James McClean from the 2,000 travelling fans from the north. But according to the Gardai, there were no arrests and no major incidents. In the posh seats, the Irish foreign minister Simon Coveney and the Democratic Unionist Party leader Arlene Foster sat side by side, and afterwards shared jokey tweets about the game. It was all mundanely, inspiringly prosaic. From London, meanwhile, came a bleak reminder of the precariousness of the detente. As prime minister Theresa May's draft Brexit agreement was ripped to shreds from all sides, as the hard-right wing of the Conservative Party stepped up its sabotage campaign, the prospect of exiting the European Union without a deal loomed ever larger. And if no-deal promises chaos for Britain, then for the island of Ireland it is an outcome that invites nothing less than catastrophe. For those of us in Britain, a sea and a generation away from the fecklessness and slaughter of the Troubles, the Irish question remains a largely conceptual issue, shamefully underexplored during the referendum campaign and poorly understood even now. But in a way, the very fact that north and south can meet in a meaningless friendly and play out a dull 0-0 draw is its own small miracle, a measure of just how far we have come from the era of barbed wire and terrifying militarism, and just how easily it could all slip away. You barely notice the border these days. At most of the 300 crossings between north and south, only the road signs will give away the fact that you're switching countries. The army watchtowers that studded the hilltops of south Armagh are long gone. The long queues and military checkpoints are but a grim memory. And yet the return of a hard border isn't some dystopian fantasy, but living history, and a history we are merely a few political twitches away from reliving. The faultlines may be fainter these days, but two decades on from the Good Friday Agreement, only the most foolhardy would deny they still exist. Martin O'Neill, who played for Northern Ireland and now manages the Republic, can still remember being booed by his home crowd when he first played at Windsor Park, and can sympathise with the abuse received by McClean, a fellow Derry Catholic. "It's ingrained in you," he said ahead of this game. "I know exactly what James is going through." And yet O'Neill also spoke of the bonds that were forged between Protestants and Catholics in that 1980s side he played in: the likes of Sammy McIlroy and Gerry Armstrong, O'Neill and Norman Whiteside, all coming together in a common cause and qualifying for two consecutive World Cups. At Euro 2016, fans from the two Irish teams were jointly awarded the Medal of the City of Paris in recognition of their "impeccable behaviour". Sport can divide, but it can also heal. This is the fragile peace that the lunatic right-wing fringe of the Conservative Party seem intent on disrupting. A recent report by Queen's University Belfast and Ulster University found that the threat of dissidents capitalising on Brexit and re-establishing conflict in Northern Ireland was more real than many in Britain are prepared to admit. "Brexit was manna from heaven from our perspective," a member of the dissident political group Saoradh told researchers. "The harder the better." In a way, all peace is fragile. Normal life can never be taken for granted. And this is doubly true in a place well acquainted with the infinite corruptibility of humanity, where the well of division already runs several leagues deep. As the whistle blew for full-time at the Aviva, there were a few scattered boos: not out of sectarian hatred or personal antipathy, but because it had been a bloody awful game. Some sentiments, reassuringly, do unite us all.